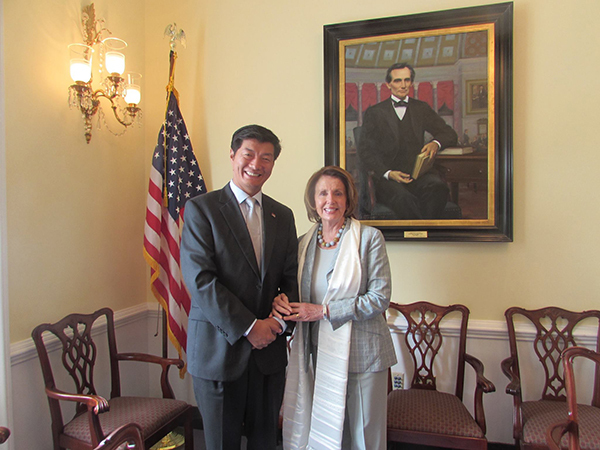 (TibetanReview.net, May20, 2015) – The head of the exile Tibetan administration at Dharamshala, Sikyong Lobsang Sangay, concluded on May 17 morning what has been described as a successful visit to Washington DC. The visit was part of an ongoing effort to affirm closer ties with overseas Chinese scholars and students, garner international support for the Tibetan movement and meet with local Tibetan public, said the exile administration on its Tibet.net website May 18. The statement said the visit culminated with a special address at a diplomacy training for officials of the exile administration’s overseas offices, and a series of meetings with senior US officials, congressmen, and a public talk to the Tibetan community. The report said that in meetings with staff members of the Congress, government agencies and influential people, the Sikyong introduced the democratic aspect of Tibetans in exile and the tragic situation in Tibet. The meetings included those with House Minority Leader Ms Nancy Pelosi and Senator Mr Tom Cotton. The Sikyong was stated to have left for Toronto on May 17 morning.